Last week we chased the White Rabbit down to Wonderland, and now we're being whirled away to yet another magical world. Ensen from Dr. Claude's Emporium researched how to find Oz. 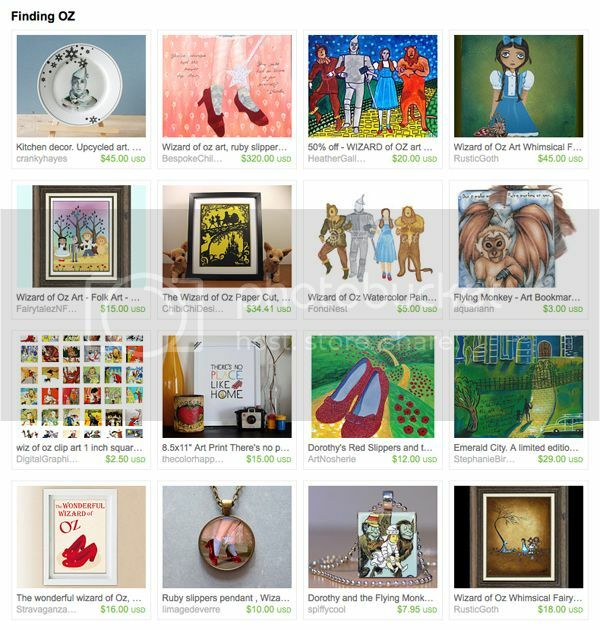 His Wizard of Oz gift ideas include Tin Man decorative plate by Crankyhayes, There's No Place Like Home print by The Color Happy and my flying monkey art bookmark. Thanks for letting me link my treasury here! Love your blog! Lovely Treasury! Oops I think I have put up a wrong link, can you plz delete it for me. Your link works, Art Bug! You're allowed to link to a blog post as long as it's featuring a treasury. This is a fun, fun, FUN collection! Wizard of Oz was my most favorite movie when I was little. Those are lovely finds! I especially like the plate! Such a cute treasury. I love the theme especially. Wizard of Oz was one of my favorite movies growing up! I am sorry I posted mine twice, it did not look like it went through. I love your blogging site to give us extra prompting for our treasurys. I look at a few of the treasuries and they are great. Thanks for playing, Dawn! The duplicate link has been deleted.